The dogs & I were invited along to the Lygon Arms to stay in one of their dog friendly rooms. We stayed in a Courtyard Suite, which was a beautiful ground floor ensuite, with a king sized bed, sofa, coffee machine and everything else you could need. Outside the room are a table and chairs, perfect for sitting out on the terrace on a sunny evening. All which is also wheelchair friendly. The Lygon Arms looks directly onto the Broadway highstreet, so you can just pull up and the staff offer valet parking around the back of the hotel, so it’s all taken care of for you. Dogs stay free until the 31st of December, after that it is £25 per dog, per night. Dog beds, poo bags and a chew each [Which of course they spotted straight away] are included and left in your room. Although no dog bowls so remember to bring your own for food and water. Talking about food – when travelling I switch the dogs back onto Guru so I don’t need to worry about a freezer or go through the hassle of asking if I can use a freezer wherever I’m staying to RAW feed my dogs. Unlike many so called ‘dog friendly’ hotels and accommodations, clean and well behaved dogs are actually allowed on the furniture which was just perfect! Good job the bed was kingsize otherwise they’d have kicked us out! Unfortunately you’re only allowed a maximum of two dogs to stay, however that is still so much better than most hotels and they really do love your dogs here with the staff making a fuss wherever we went. Staying away it can be pain lead walking your dogs every time they need the toilet. But a 30 second walk out of the door was a huge garden just over the road to let them run around off lead and do their business. It was so well kept with beautiful flower beds, seating and even a mini maze! There are also bins dotted around to clear up after your dogs and keep it clean for everyone else to use. If you’ve got children this is also a great place to play and burn off all that extra energy, there’s a football goal for those who are sporty. 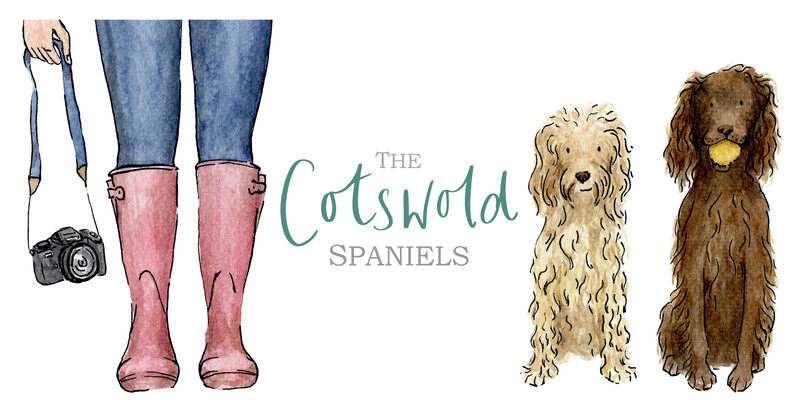 Of course if you explore the beautiful Cotswold Countryside then you may have muddy boots and muddy dogs. Situated out in the courtyard there is a muddy paws hosepipe to wash away the days adventures. You don’t have to miss out on the dining experience if you’ve got dogs because they join for dinner in the Terrace restaurant. Woody & Wilma were very chilled sleeping at our feet, and the waitress also made sure they had everything they needed and brought them a bowl of water. With the winter nights drawing in it was too dark to show you our mains, but this was best salad I have ever had, so definitely try the Chicken and Avocado salad to start. You can also eat in the Terrace for breakfast with your dogs, but I’m not bothered about them being with me 24/7 so we went to the main restaurant without dogs where you could order hot food or there was a range of pastries, fruit and yoghurt etc. When leaving the dogs alone in the room there’s a special do not disturb sign for pets. This means staff see this and don’t disturb your dogs or upset them with a stranger going in to clean or fill up your mini bar. There’s so much to do in the surrounding areas with many of the Cotswold towns just a short drive away. Whilst staying in summer you can just go 5 minutes up the road to visit Cotswold Lavender to see the gorgeous purple rows. If you want to capture some memories during your trip you can even book a photoshoot with me for your family and dog – visit my website here. So have a look on their website here for their different rooms and availability, it’s such a beautiful hotel in the heart of The Cotswolds and they certainly will make you feel right at home. We look forward to seeing your Cotswold getaway. Thank you to the Lygon Arms team for inviting us along. Woof! That looks super lovely… I’d love to take my humans there! You’ll have to treat them! Looks so lovely, the rooms look amazing & always yes to prosecco! It was beautiful. Glad you like Prosecco, this was champagne!